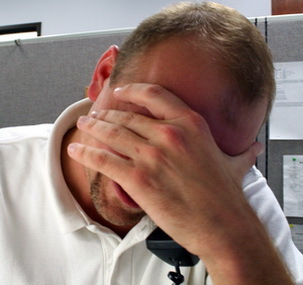 At this point there is a problem to deal with – stress. Massage can be one of the best ways to relieve this. Actually the results of a good massage session can be amazingly effective when it comes to relieving stress. It works very well and there are no potentially negative side effects as with pharmaceutical solutions. People who suffer from stiffness and pain can often get significant benefits from massage. In most cases, a stiff neck is better treated with a good massage than with muscle relaxants. Some modalities like Thai Massage are especially effective when it comes to dealing with stiffness and limited range of motion since they incorporate stretching into the therapy. I live in Thailand. Here massage is often done in a very public setting. This is possible since it is mostly done fully dressed. Especially foot massage lends itself to social interaction. Clients sit in recliners and they often engage in conversation with their therapists, or they chat with friends or make new ones just by talking to people who sit next to them. 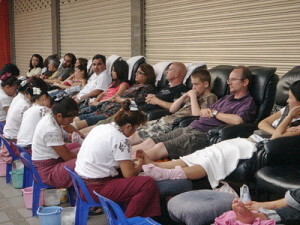 Foot massage is often done in very public places like busy markets or at a mall entrance. Many people enjoy doing some people watching while getting their foot massage or just watching the world go by. Personally, I have met some very nice people while getting my session. This scenario is more common in Asia whereas in the western world massage tends to be a more private affair. Many people spend most of their free time looking at a TV screen or a computer monitor. Especially here in Thailand where massage is much more affordable compared to western countries, a visit to a massage shop can be a great way to get away from the routine. It is a much healthier alternative than hitting a bar for a drink. There are people who really want to talk to someone who is not involved in their life, who doesn’t know them and who has no opinion about their situation. This can put massage therapists in the involuntary role of being an unpaid (and unqualified) psychologist. However it can be a great relief for the client if someone is compassionately listening to them and offering some positive comments without getting into specific counseling. I always remember the case of a client of mine who had been brutally gang-raped and was really traumatized. It had affected her social life badly. During my sessions she felt safe and trusted me, and she spent most of the time talking to me. For her, this was exactly what she wanted and needed, and preventing her from doing so would have been highly insensitive and counterproductive on my part. She was a very satisfied long term client. It worked for her, and all I had to do is make her feel safe, supported and heard. I can do that, even if it is not exactly part of my job description as a massage therapist. Another case from a different perspective is a program which was developed by the woman’s prison here in Chiang Mai, Thailand. Some inmates, mostly soon-to-be-released non-violent drug offenders, were trained as massage therapists. It gave them the chance to get out of the prison during the day and interact with massage clients. Naturally they were eager to talk to someone besides their fellow prisoners. It was a big relief valve for them to balance out their unpleasant situation in prison, and it provided them with an education which they could use to make a living once they were released. I know of one inmate who, after serving her sentence, ended up marrying her client whom she had worked on regularly in the prison’s massage shop. You just never know what can happen! I know – massage therapists cannot claim to cure anything. But often regular massage treatments can have a very beneficial effect on some serious and chronic diseases. I have met many massage clients who can attest to this fact. In Thailand the government protects the status of Thai Massage. Its knowledge is engraved in the walls of the famous Wat Pho temple in Bangkok. We also have to remember that massage has been used in many countries, especially in Asia, as an important way to improve people’s health for hundreds and even thousands of years. Massage in Asia has more often than not been a way to deal with health issues, and not just a way to relax and pamper yourself. To this day here in Thailand pretty much every village has a resident massage therapist. He or she works on people who have problems, in conditions which are a very different from luxurious spa settings, meaning extremely simple, like a straw mat on the floor. The wide availability of massage as a luxury to pamper yourself is a fairly recent phenomenon which had been previously reserved for a few wealthy and privileged ones. The health benefits of massage have nowadays been amply documented. Many people realize that a regular routine of massage sessions can play an important role in maintaining their health. Some obvious examples are professional athletes or dancers. But even people who work on computers all day long can counteract potentially serious trouble with hands, shoulders, neck and back through regular massage sessions. One of my personal favorites is getting a neck and shoulders massage from my co-rider during a long distance motorbike trip. Hanging on to those handlebars can really cause bad neck pain, and a good dose of massage can change the experience from painful to enjoyable. Even the best massage therapists can add new skills to their repertoire by experiencing sessions from other qualified professionals, or learn new ways or modifications that can help them in their work. This one applies to the countless massage therapists who treat their clients all day long. It is a well-known fact in the profession that therapists need to get regular massage themselves. They need to feel what it is that they are doing to others, and become inspired and motivated to grow and take their work to new levels. Otherwise they are like cooks who never taste any of their preparations. Massage can feel truly heavenly. A good session can change your energy in such a way that you feel like walking on clouds afterwards. Some non-physical symptoms can be that your mind clears up, your thoughts turn positive, your happiness level increases, and you feel light and energized. For many people, especially in cultures where touching is severely restricted, massage can be their only way to allow themselves to be touched, to drop their cultural indoctrination for a while and to just let go. This can also be very beneficial for people who are compulsive givers, who feel that they have to take care of everyone else. Massage can be an important way for them to turn the tables and just receive without having to or even being able to give back. It can be an important way to replenish their energy by just letting go and receiving. Thai Healing Massage Academy provides a wide range of online training programs which teach you the art of Thai Massage in a convenient and cost-effective way. These courses go beyond the mechanics of massage. 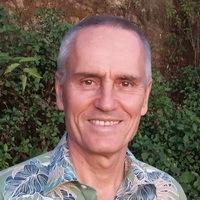 They address client communication and psychology, energy exchange techniques, energetic healing principles, important skills for therapists to maintain their own health, methods to develop your intuition, and many other skills to round out a comprehensive massage education. for me the most valuable benefit of a good massage session is to feel yourself better about the touch of somebody else. I am responding to request for comments regarding Lovers,Friends and Family massage video-:)I am only half way through the programe for the first time,( just to get the flavour of it )and am very impressed, it is worth far more than the measly $10.00 paid And I firmly believe this routine can be used as a complete therapy to all clients,but at a later stage will take the full foot massage course. I recommend this course though to anyone who only wants to keep it for family and friends. It is an investment well worth making, if you do not invest in anything else PURCHASE this massage system immediately!! thanks for your endorsement of the MASSAGE FOR LOVERS, FRIENDS AND FAMILY course. Yes, this $10 special was a real deal. Just so that nobody gets confused reading this, the $10 price is not available anymore, but even at its regular price of $30 this is a great investment, and I hope that some people will follow your recommendation. You are the second person who told me that this course could easily be used as an entire real session, and I agree. 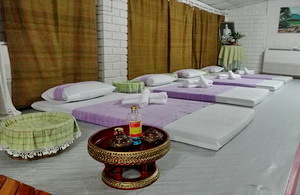 It is a great starter course for Thai Massage. If you like this small course, can you imagine what you would get out of the COMPLETE THAI MASSAGE training program? Thanks for your input, Coco. That’s a very good reason for giving and receiving massage. Like you said it works both for giver and receiver, and it can be a great energy exchange. does home delivery during their years. blood clots, encourage deep sleeps and best of all help to regain back it shape. its position and helps the body to recover from the trauma of birth. down tummy perfectly. The Post Natal massage is highly recommended to both Normal & C-Section delivery. That’s a great reason for getting massage, Noura. Thanks for this contribution. This is one I had not thought about. I am a student. This is very informative and it so happens that our topic is about this. Thanks!